The YPbPr VGA HDMI Input VGA output BOX is a revolutionary product that allows you to use the full resolution (up to 1080p) of any HDMI device on a CRT projector, PC monitor, older HDTV/Plasma TV, or any other device without a HDMI input! If you own a high quality projector/monitor/TV that does not have a HDMI connector you need this device! Why buy a new expensive display device when your existing one can already support high definition? 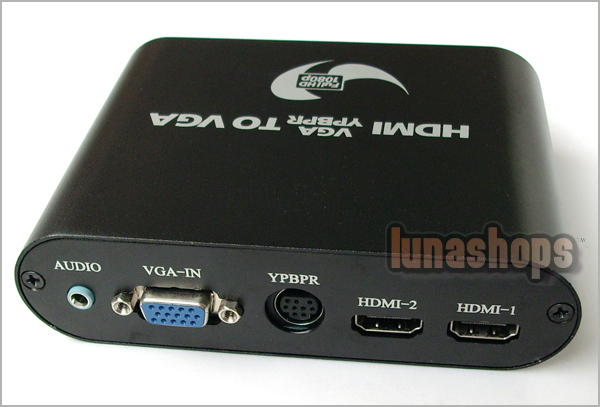 The YPbPr VGA HDMI Input VGA output BOX allows you easily add digital devices such as HD-DVD/Blu-Ray players, PS3, X360 Elite, Satellite/Cable HDTV set-top boxes & HTPCs with HDMI graphic cards, to name a few! Simply connect the Convert HDMI to YPbPr/VGA HD HDTV BOX into your projector, your HDMI device into YPbPr VGA HDMI Input VGA output BOX, and be amazed by the difference ! 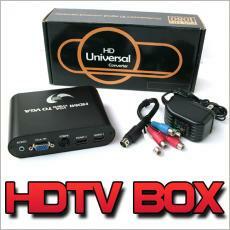 The Converter HDMI to YPbPr/VGA HD HDTV BOX delivers a razor sharp picture with absolutely NO video noise. The picture quality improvement as compared to RGBHV analog video is immediately obvious, providing an amazingly clear and detailed picture! 2.100% hardware transform, Perfect effect. Supports all resolution and refresh rate (as long as you stay below the 165Mhz pixel clock limit). In other words, 1080i/72, 1080i/96, 1080p/60, 720p/60 are all supported as well as 1080p/24Hz. 1080p/72 is just slightly above the 165Mhz limit, but you could reduce the horizontal resolution slightly to 1770x1080@72 at the source or using a scaler. With a good scaler, it is unlikely you would ever notice the 1920->1770 reduction. HDTV ready (480p, 576p, 720p, 1080i, 1080p/48/50/60Hz compatible). 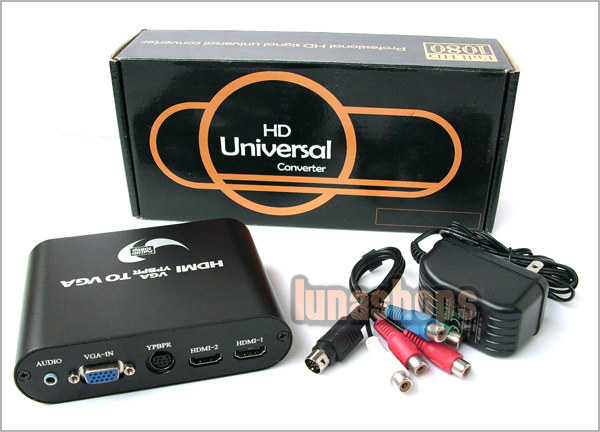 The Converter support 2 Channels HDMI input,1 YPbPr.,1 VGA Input and VGA port output.Simply switch the Input Button to HDMI1 or HDMI2 for choosing the channel. Also you can choose to output to VGA or YPbPr. 1. I have a CRT TV set which is have the YPbpr port, can i buy The Converter? we suggest that you set it to 480P or 576P. 2. My projector is VGA port input, Can i use the Converter? Answer: Yes , You can. 3. I have xbox 360 , ps3 console and a VGA port monitor, and you connect them to the monitor in the same time? 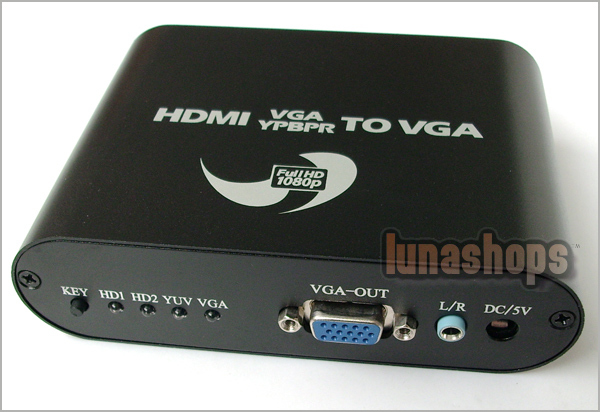 Administrator:Hello, it is YPbPr VGA HDMI Input, not S video input.